Mars: As Space Engine normalizes atmospheric pressure to the topographically lowest location on a planet's surface, setting it to the Martian mean of ~6mbar leads to an error. This pressure is achieved at "zero elevation" on Mars (e.g., around the Spirit landing site in Gusev crater); in fact this elevation is defined by an average atmospheric pressure value. Space Engine, however, sets it to the northwestern Hellas basin floor, which is the lowest spot on the planet. Pressures here are actually around ~12-15 mbar. Titan: In Space Engine, seas/lakes on Titan are falsely distributed in the equatorial regions of the moon. Probably the global, dark dune fields, forming a band around the equator, were mistaken for lakes. In fact, almost all bodies of liquid hydrocarbons on Titan are currently (northern spring) located around the north pole. Only one body of liquid is confirmed near the south pole (Ontario Lacus). Vesta: Vesta's surface features some unnaturally brown areas, mostly at lower elevation. 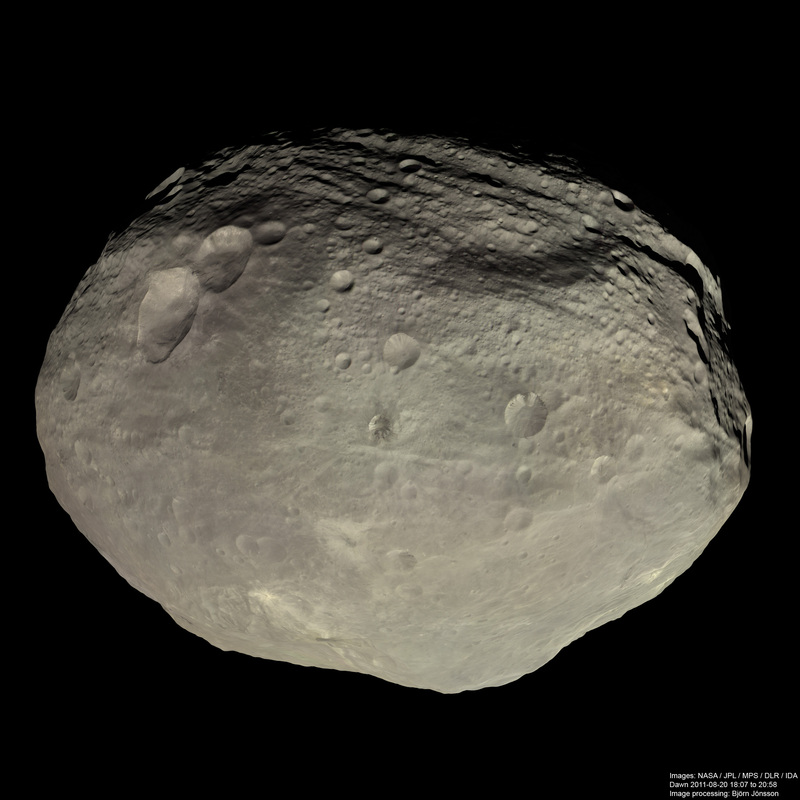 To the unaided eye, Vesta would show no such natural coloring. I discussed this with SpaceEngineer already, but he seemed to think that having some surface liquid was better than having none, and since the diffmap was used as a height map the result was seas in the tropics. I agree with you that they should be removed. The distribution of color on Vesta is procedural since there isn't a good, publicly available complete global color map for the planet. The color scheme for the world as a whole however is accurate, based on the best available color data. There is plenty of room for liquids on Titan - In those areas where they really exist! In my opinion it is absolutely adamant for Space Engine to be as truthful as possible wrt Sol system bodies. Artistically filling up data gaps is one thing and absolutely acceptable, but the redistribution of crucial surface features for the sake of aesthetics will "scare" away any person, who wishes to use this program for educational purposes (seeking a better alternative to Celestia and co.). In this case it is absolutely unnecessary. Sure, the actual shorelines around the northpolar lakes are not well visible in VIMS data, but they could easily be inserted using RADAR data. Furthermore, Cassini's last Titan flyby included new VIMS observations of the northpolar lakes, so any new global Titan map that is going to be released (within a few months?) will greatly improve on the disadvantageous viewing condition in the land'o'lakes. Even procedural color generation can be controlled. On Vesta this should just include tones of grey, definitely no brown. There is plenty of room for liquids on Titan - In those areas where they really exist! But there is no way to get that information into SE. There is no global topographic map for Titan, which is required, and anyway it will always fill all places up to a certain elevation with liquid regardless of whether it's really there or not. There's no way to use SE's pseudo-3D water on a planet otherwise. It's easy to say "put this there", but actually making that happen is usually extremely difficult if not impossible. Yes it should. As I said, the colors there match the real colors of Vesta, as sampled from a published true-color map of the planet, which also match well with this image processed by Bjorn Jonsson. This is natural color, not enhanced color. There are global topographic maps of Titan, however they contain relatively little information and consist mostly of inter- and extrapolated stretches based on low order spherical harmonics. Interestingly enough, their accuracy is quite acceptable around the north pole. However, just using this map as baseline would result in exactly the problem you've mentioned. Although the equatorial dune fields are among the highest terrain, and would therefore remain dry in Space Engine, other dry basin in the south would get filled up. I'd therefore suggest to create an artistically inspired elevation map, like it was done for the Galilean moons, and make sure, that the actual lakes mark the deepest spots on Titan (and the dune fields are not), therefore not just evading Space Engine's limitation, but exploiting it. I am aware of true color imagery of Vesta, a few of my colleagues are part of the DAWN team Nevertheless, certain, low-lying areas, e.g. Feralia Planitia, appear unnaturally brown in Space Engine. Like I said, this is easy to say, but difficult to do. You're welcome to try it yourself if you want. Nevertheless, certain, low-lying areas, e.g. Feralia Planitia, appear unnaturally brown in Space Engine. Again, as I said, it's procedural, so it's not going to be accurate. I was just refuting what I perceived to be a claim that there is no brown on Vesta, just gray. You can try changing the order that the colors are specified in Vesta's entry in the asteroid catalog to get different results if you want, but it's never going to be realistic. I didn't say it was easy. I merely said it would be the best alternative, given that it has already been done for other bodies in the Sol system. I am not here to offer myself as a co-programmer (also I thought Space Engine was a closed source project), I just point out observations. It is up to the author what to do about it. Still, there has to be a way to prevent low lying areas on Vesta to be brown(ish). Other procedurally generated asteroid surfaces do not appear with such brown regions. Other procedurally generated asteroid surfaces do not appear with such brown regions. Because others do not use the same color palette as Vesta, and in fact don't even render color in the same way. As I said, mess around with the catalog entry if you want to try to change the color distribution. it has already been done for other bodies in the Sol system. Not to the extent that it would be necessary for Titan. Making a map doesn't require any coding or source code access. Anyone can contribute textures, and most textures currently used were made by people other than the developer. Io, for instance, seems to feature a global elevation map, which was handcrafted (?) to emphasize landforms seen on the real Galileo/Voyager mosaic. I am not sure I understand what the difference between the artistic topo-maps for the Galilean moons vs. Titan would be. Nevertheless, I do acknowledge, that creating such a map is probably time consuming. Were the current ones for Io and co. done by the community or by the developer? Io, for instance, seems to feature a global elevation map, which was handcrafted (?) to emphasize landforms seen on the real Galileo/Voyager mosaic. The Io elevation map is just a grayscale copy of the color/albedo map, the same as Titan. All Galilean moons use this method, or a variation of it. I see. It shouldn't be that difficult to modify the VIMS-Titan map, i.e., to make sure that the actual lakes are the darkest (i.e., lowest) areas and maybe refine their shorelines with the RADAR swaths a bit. Based on your experience, could such an "improved" product be forwarded to the developer in order to be incorporated into the program, or would it stay an optional add-on? Based on your experience, could such an "improved" product be forwarded to the developer in order to be incorporated into the program, or would it stay an optional add-on? If someone were to make such a product, and if it were of sufficient quality, then yes it he would incorporate it into the default distribution. In this case it is best to wait for the upcoming (next few weeks/months) release of a new global VIMS map of Titan, including new images taken around the north pole, and use this as a baseline for any modified/improved map. There are no good grayscale global elevation map and a liquid mask available on the web. SE also needed an artifical elevation map edit to make lakes below the zero level. If someone will make such maps, I will immediately include them in the next version. I will also improve the method of representing the ocean surface to allow local changes of the sea level or/and ocean coverage mask. This will allow to make a Titan model with a real elevation map and lakes only near poles. Ok, it is be possible to simply make all elevations on Vesta equally gray (just change all color*** parameters in the Vesta catalog entry). This fix must be included in the patch. The better solution of course is a good hi-resolution global map with fixed seams and gaps. I hope it will be released eventually. I made these maps. For Io, Ganymede and Callisto, the elevation map is a simply grayscale version of the color map. This works relatively good for Io and very good for Callisto, which have a lot of craters with a white rim (which becomes a hills in the elevation map). For Europa, the elevation map is a inverted grayscaled color map, to make ice cracks looks like double ridges. Some prominent craters then made back as depressions. For Titan, using the radar reflectance map as an elevation map gives the result you are seen in SE 0.972. Yes, this will be cool. Maybe I will make improved 3D water map options for the same time. For Titan, using the radar reflectance map as an elevation map gives the result you are seen in SE 0.972. How so? There is no global radar map for Titan, only small regions of the surface have been mapped. The only global map is infrared.